Ben Carson’s way of handling the insults from Donald Trump is different from all the other GOP presidential candidates, he apologizes for provoking Trump. 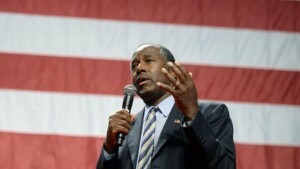 Carson said he had said something that sounded as if he questioned Trump’s faith. The retired neurosurgeon said he was not, but it came out in a very inappropriate way, which he recognized and apologized. The doctor’s display comes after Lindsey Graham, Scott Walker and Jeb Bush found themselves diminished following their tussles with Trump. For Dr. Carson, avoiding a confrontation with his biggest competitor for the support of the anti-establishment is part of an effort to become the anti-Trump. The collision between Trump and Carson was inevitable as both rose in the national polls. Trump’s audacious campaign has sent Republican politics on a roller coaster ride this summer. Mr. Carson moved in close and drafted behind Trump. The former physician at John Hopkins now is second in national polls and attracts followers who want someone who will defy political convention, as does Trump, but prefer a demeanor that is soft spoken to that of the brash reality television star. One Republican said that Trump was just a flash in the pan that was saying things many people wanted to hear, but Carson would be the better president and most people are aware of that. While Trump carries out spectacle style events in arenas and stadiums, Carson hold his events in places such as banquet halls. While Trump hollers out his message, Carson delivers a speech in a quiet tone that at times might be hard to hear. Trump is tapping into the anger of the Republicans about immigration while Carson is focusing on his biography, covering his move from poverty in Detroit to becoming one of the world’s renowned neurosurgeons. The difference of opinion between the two began last week when Carson was asked to make a comparison between him and Trump. He said he was more devoted in his faith, which prompted attacks from Trump in which he called Carson an ok doctor.